Somewhat tellingly, the Jennifer Hudson/Terrence Howard starring Winnie Mandela, which focused on the famous statesman’s wife during his imprisonment, is just getting a limited theatrical run now after premiering at Toronto two years ago. 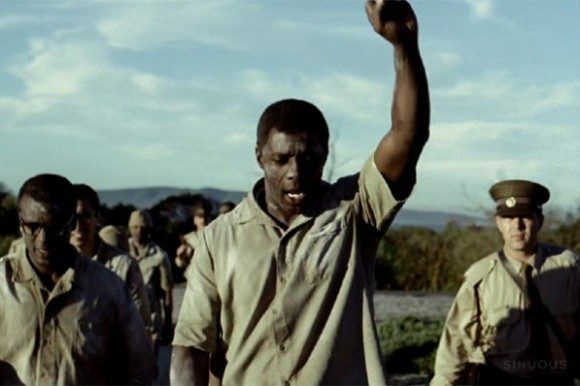 Mandela: Long Walk to Freedom is hoping for a much better result, including, with any luck, a few golden statues. This newer film features the talents of Idris Elba (Pacific Rim) as Nelson Mandela in an ambitious adaptation of Mandela’s 700+ page autobiography Long Walk to Freedom. The project was directed by Justin Chadwick, best known for The Other Boleyn Girl, and the script written by William Nicholson, Academy Award nominee for Shadowlands and Gladiator, and more recently of Les Miserables. It seems Nicholson’s adventure into adapting the lengthy Les Miserables (although surely he was constrained by the faithful – if flawed – appropriation of the musical) didn’t much prepare him for Mandela. The chief complaint is that the film is sensationalized, hitting every big, important historical fact, but doing very little to reveal a man who lived and breathed. The “CliffNotes version…[that] never opts for a light touch when a sledgehammer will do,” says Variety critic Scott Foundas. From production design to cinematography to (perhaps especially) the direction, the consensus seems to be that while not quite exploitative, it’s certainly melodramatic to a fault. That said, this is Elba’s show, and by all accounts he shines as Mandela. Where other elements of the film lack subtlety, he dives headlong into “Madiba,” mimicking his vocal tics with alacrity and presenting a portrait of a struggling man. Says THR’s David Rooney, “Elba conveys the changes and the consistencies of a half-century with subtle economy.” Of a similar quality is Naomie Harris. Though given, perhaps, less leeway by the script, Harris is sharp in the role of the increasingly militant Winnie Mandela, leaving some to wish Harris had been given more to do, particularly during Nelson’s imprisonment. All told, Mandela: Long Walk to Freedom appears to fall a bit flat, especially when compared to other race-relations dramas out later this year such as 12 Years A Slave, but Elba figures to join that film’s Chiwetel Ejiofor and Dallas Buyers Club‘s Matthew McConaughey on the short list of likely Best Actor nominees.